The past few months have seen us very short of eggs. For the first time in about six years we resorted to buying them. The very dark days this winter with all the rain, combined with the demise of Esme have been the cause. Previous hens have laid a few eggs throughout the winter, but this has not been the case with the bluebell girls and elderly Lorna only manages about three eggs every two weeks. A brief burst from Tiffany a couple of weeks ago allowed us to have a few lunches involving poached or boiled eggs, but alas she has stopped laying again. As for Anna – nada. At this rate we are going to have to consider increasing the flock – eggs had become a really important component of our diet and their absence also means no cake! The new residents* are impressed! It was with great joy, therefore, that we accepted a gift of four eggs from Kate the other day. Now, you might feel that four eggs is rather stingy. But, what if I tell you they are goose eggs? Each one weighs about 165g – nearly 6oz! 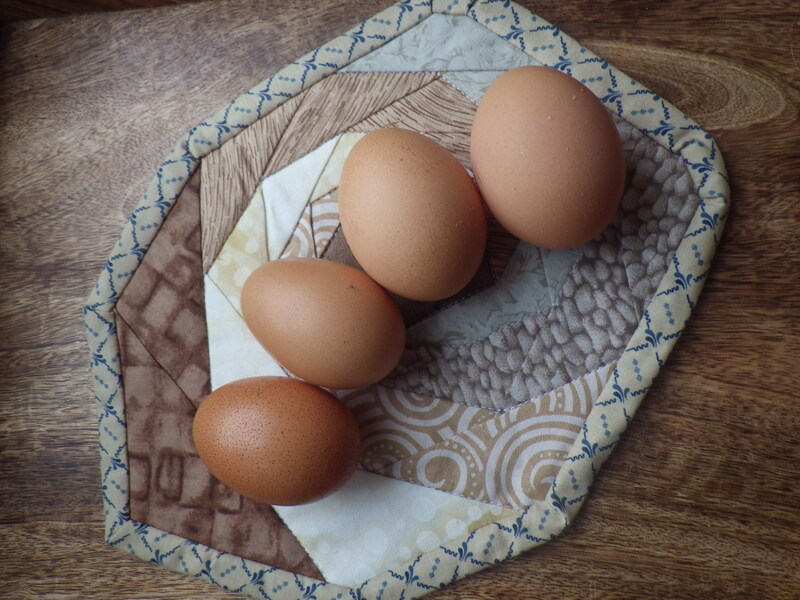 For comparison I weighed one of Lorna’s eggs and that came in at 70g – less than 2.5oz. I don’t often get to cook with goose eggs, but my experience is that they make deliciously light cakes… and so I used two of them to make a huge chocolate-orange cake, with chocolate-orange butter cream and a chocolate ganache topping. So, if any of you are passing in the next day or so… call in for the most delicious cake, made with an ingredient that most people will never get the chance to use. Quick before the critters get it! * There has been a bit of an invasion: two mousevaarks – Iolanthe and Arnoldo – and Tali, a molevaark**. **It’s amazing what some people do with old socks! Our experience with chickens over the years has always suggested that they are binary: either they are healthy or they are just about to die. In the past, every hen that we have had that has become sick has died. 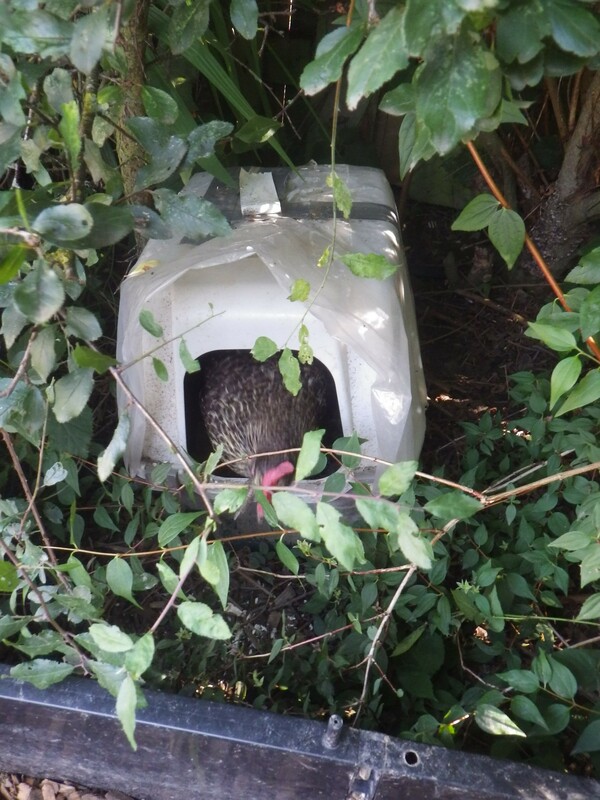 It hasn’t mattered what we have done – trips to the vets, antibiotics, herbal remedies, changes in diet, flushing vents out with warm salt water (yes, really) – the hen has died. So it was with great sadness that I noticed early last week that Esme was under the weather. With hens, the first symptom that you notice is lethargy – they don’t come out of the house straight away in the morning and when they do, they sit around, fluffed up, looking glum. All the sitting around generally leads to them getting a dirty rear end, particularly since another common symptom is very runny poo. If you read any of the dozens of web pages about sick chickens you will find many references to hens becoming egg-bound (i.e. getting an egg stuck inside them). Diagnosis is easy – you stick your finger up the chicken’s vent and see if you can feel an egg (glamorous activity, chicken-keeping). I used to be squeamish about this, but it becomes commonplace (if not fun) eventually. 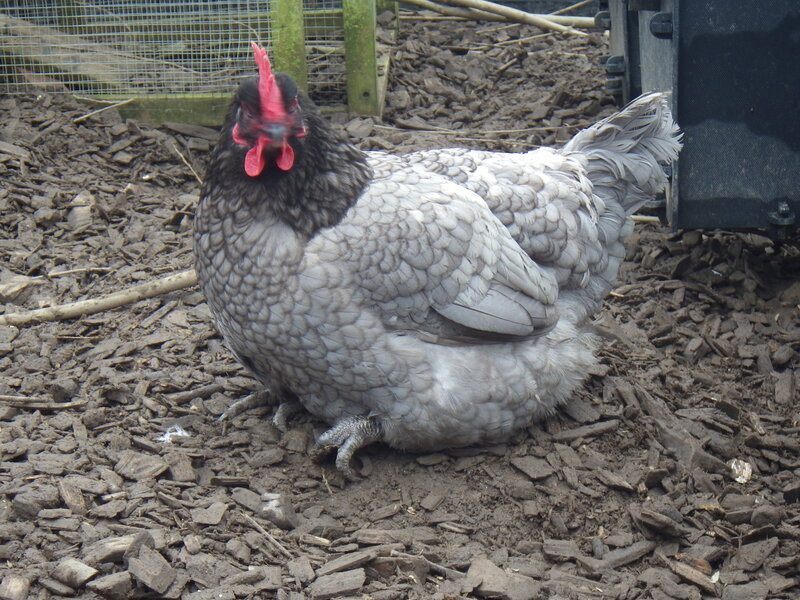 I would have been surprised had Esme been egg-bound, as she hasn’t laid for months now – she’s an old lady. A quick examination confirmed the absence of any egg and so I had to decide what to do. Knowing that any intervention tends to distress them, I chose to leave her alone. My only action was to give her a bowl of rolled oats and live yoghurt every day so she had something nice to eat that might improve her digestion and would give her fluids. She remained glum for several days, her comb was droopy and dark, her tail was down, she shuffled around showing little interest in anything much except the oats. We resigned ourselves to her imminent demise. And then she started to perk up – eating from the feeder, wandering around the garden a little. We assumed that this was her final fling – Aliss perked up like this just before she died. But Esme continued to get better. I clipped the mucky feathers below her vent and she preened the rest clean. And now she’s scratching around with the others, perfectly happily and her comb has returned to its usual colour. Now, I may be proved wrong, and she may keel over as soon as I publish this post, but I think not. I think she has recovered. Chickens are very good at hiding illnesses, so it’s always a bit of a surprise if one of them is obviously under the weather. They are prey animals and it doesn’t do them any good to appear weak, so they fluff themselves up and put a brave face on it. As a chicken keeper this is deeply unhelpful because it makes it really easy to overlook a problem. 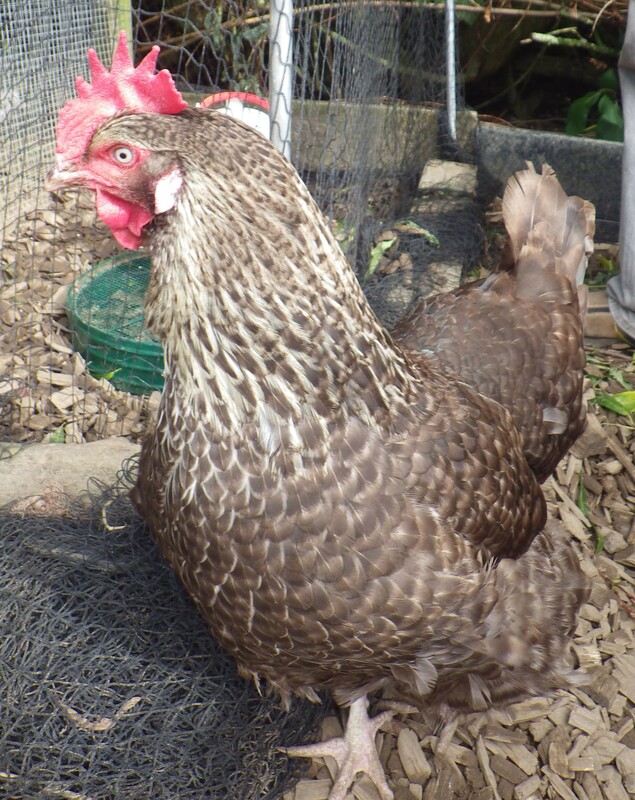 However, it is hard to miss a large bluebell hen hobbling round the garden and sitting down whenever possible. As with human ailments, it’s probably a mistake to take to the internet too soon, where you are bombarded with possible ailments – anything from being egg-bound to having bumblefoot. However, a quick examination revealed nothing – apart from the fact that there’s nothing wrong with her ability to peck (I really wish I hadn’t had my sleeves rolled up). My conclusion is that she’s got the chicken equivalent of a sprain… possibly from jumping down off the higher perch in their house – her preferred roost. Apparently this can be an issue with heavier birds, and Anna is certainly one of those (bluebells are huge). My remedy, therefore, is to remove said perch and make sure that she is able to access plenty of food and fresh water. Once Mr Snail returns home later today we will examine her for wounds under the masses of feathers (bluebells are also very fluffy). She’s being doing plenty of sitting down, so I don’t think enforced cage rest is necessary, but we’ll see how she gets on over the next couple of days… fingers crossed for a speedy recovery. ‘That’s ‘cos you’re a wet hen, Magrat Garlick,’ said Granny. Although all my hens are named after Mr Pratchett’s witches, until today I didn’t have a Magrat… now I seem to have four. So far today, we have had 22.6mm of rain – that’s nearly an inch – and it’s only 11:40am. * Apparently, in the US wet hens are angry, but here in the UK they are soppy. I can’t help feeling that Aliss is closely related, especially since she has been behaving like the chicken from hell this week. It always happens in the spring – she tries to escape, she spends ages trying to penetrate the vegetable beds and she refuses to co-operate. Yesterday she and Esme managed to find their way into the field behind us. Fortunately, Ifan (the young son of the field’s owners, who has his own flock of Warrens) spotted our two and managed to catch them for us. Some investigation revealed a gap under the fence which I have now blocked. This morning she was in the onion bed… at this rate, she’s going to be in a casserole tomorrow! It’s only her prodigious egg-laying that will save her!! 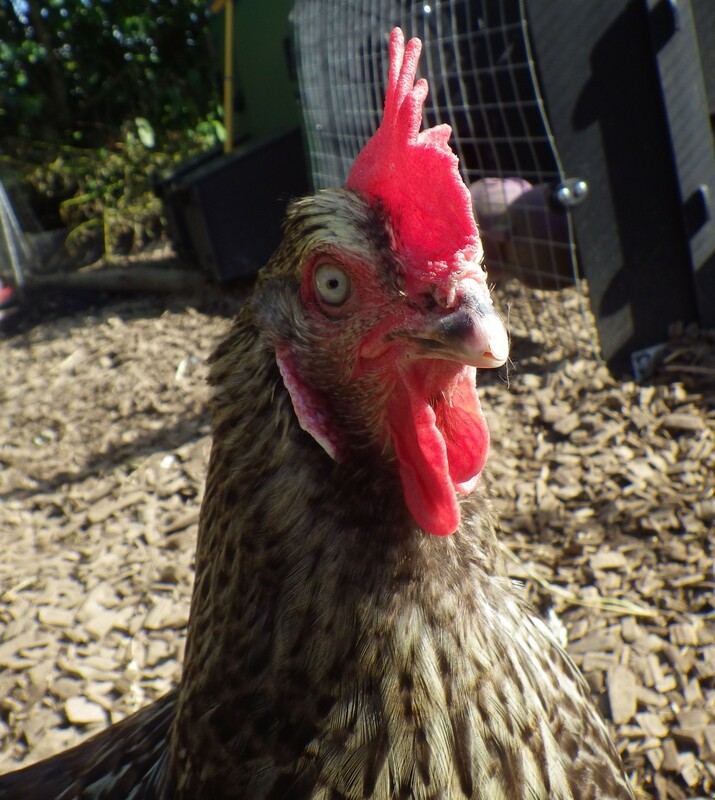 If you have been reading this blog for more than a couple of months, you may remember me describing Esme’s big moult back in the autumn and the effort that she was putting into growing new feathers. That was back near the beginning of November and since then she has not laid a single egg – rare for Esme as she has been one of our most reliable layers. However, I’m pleased to say that egg production has resumed – she laid her first on Saturday and another this morning. Perhaps spring is in the air! Esme is four years old and we did wonder whether she would lay again, but over the past month she has plumped up and is looking very healthy, so it’s good to know that she is making a contribution again. Sadly, Perdy (only two years old) is not bothering, but is looking very healthy now, so hopefully we’ll have some eggs from her soon too. Lorna, on the other hand is our slug-hunter extraordinaire, but hasn’t laid an egg since last June (and then there was only one in the whole month). So, if your hens stop laying, don’t despair, it’s not necessarily the end of production. 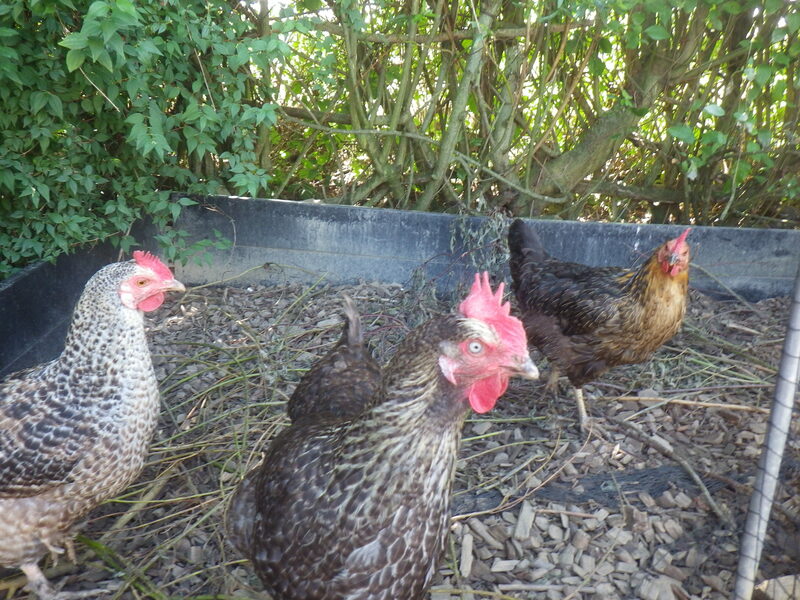 In our garden we have four chickens: Lorna, Esme, Perdy and Black Aliss. After various battles, they are now confined, most of the time, to one section of the garden. They a have a run where they can be further confined, but they are not shut in there much because, frankly, it’s boring for them. browses on the forest floor for insects, seeds and fruit, and flies up to nest in the trees at night. 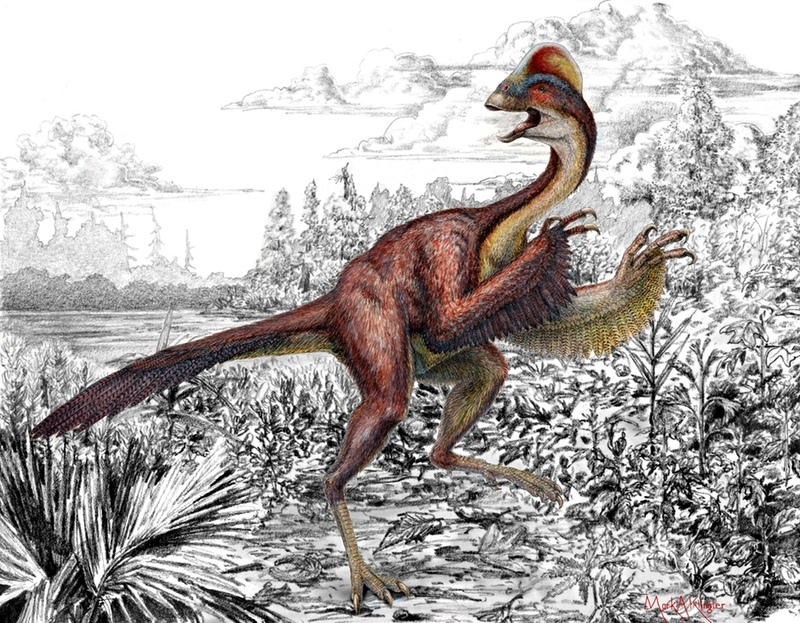 Now I appreciate that we have come a long way since the Red Junglefowl: domestication appears to have taken place 7-10, 000 years ago, and there may have been genetic contributions from three other closely related species. However, chickens do still, generally, prefer to sleep up on a perch (like being on a tree branch) and scratch around for grubs and insects, so they have deep-seated instincts. I can’t help feeling, therefore, that we should provide them with an appropriate habitat in which to live, and that a bare patch of mud or an area of open grass does not do this. In addition, a small enclosed area is likely to build up a rampant population of parasites, leading, for example, to repeated worm infestation. Our hens have open areas where they can scratch about or have a dust bath, access to the area around the compost bins, where there are often insects to hunt, intermittent access to the fruit cage, with its herbs and grasses (they are excluded when there is fruit to be had!) and an area under the willow hedge, where leaves accumulate and invertebrates live. They also visit the rest of the garden to turn soil and do the weeding! Recently they have been spending a lot of time under the trees and we decided that it might be a location where they would like to lay. With this in mind, we placed a plastic laying box (actually it’s an old covered cat litter tray that we were given) inside the hedge and this is now Esme’s preferred laying spot. Of course, this is not a safe location to spend the night, so they all happily troop into the run and then their house to roost, safe and sound and inaccessible to foxes or other predators. Animal welfare is something that anyone keeping livestock should take seriously, both because it’s ethically right and because you get better production if you have healthy happy animals. 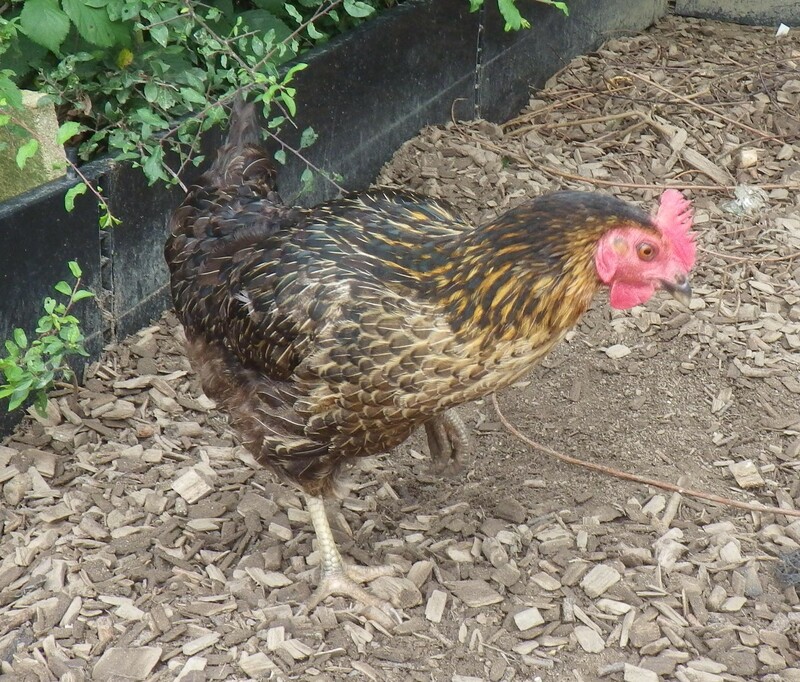 So, if you do have backyard chooks, give them some shade and an area under the trees where they can get back to their roots and release their inner junglefowl! Can I keep chickens in a fruit cage? In my earlier post on the searches that lead people to my blog, I mentioned the question ‘can I keep chickens in a fruit cage?’ My, rather glib, answer was ‘Yes, but only if you don’t want any fruit.’ I now realise that this really isn’t a good enough answer – this is a serious question. I know this because variants of it keep appearing as the search terms used to get to my blog. When we first toyed with the idea of keeping chickens, we considered the options for confining them – including whether having them in the fruit cage for some or all of the time would be possible. This was in the days before we owned any chickens and really didn’t know what they are like. I’m guessing that anyone who asks this question is, like we were at the time, unfamiliar with hens. So for all you folk in this position, I’d better describe the natural habits of these creatures. First, you should understand that hens like to dig… I don’t mean just scratch around a bit… I mean they will excavate quite large holes and they are capable of getting through really compacted earth. I recently visited some people who bought a property with an old cow shed on it. This shed contains a highly compacted layer of cow muck so packed that it requires a pick axe to loosen it. 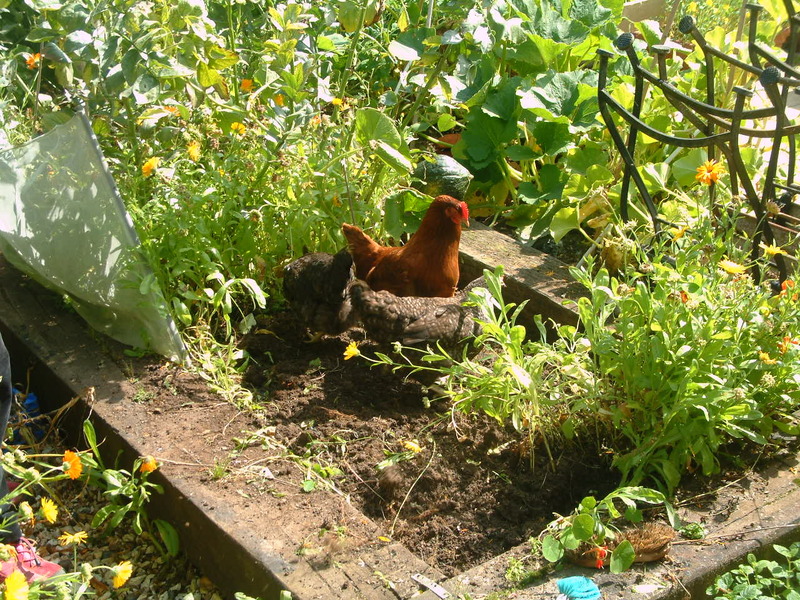 They have found, however, that their chickens are able to scratch it up, making it possible for them to excavate it and use it on the vegetable beds. You can imagine, therefore, what a chicken can do to earth under your fruit bushes. The other important thing to know about chickens is that, even though they don’t really fly, they can get quite a height off the ground if they have an incentive, or even just when the fancy takes them. Some are better at it than others, but the temptation of raspberries is likely to entice even the most portly chicken to do a bit of jumping. Wing clipping is touted as the answer by many, but that only stops them getting lift with their wings and ours can certainly jump quite high if they really want to even if they are missing some feathers. Janta at Karuna describes chickens as ‘the enemy of the forest gardener’… although he does have a few chickens, he prefers ducks. Ducks do not scratch the ground, so do not excavate your plants, they are fond of slugs and they seem less inclined to consume fruit (unless they get a taste for it). Since a fruit cage often contains an assemblage of plants that can be thought of as the lower layer of a forest garden, then Janta’s experience suggests that there is no place for chickens in your fruit cage. My answer, however, is a little more complicated. 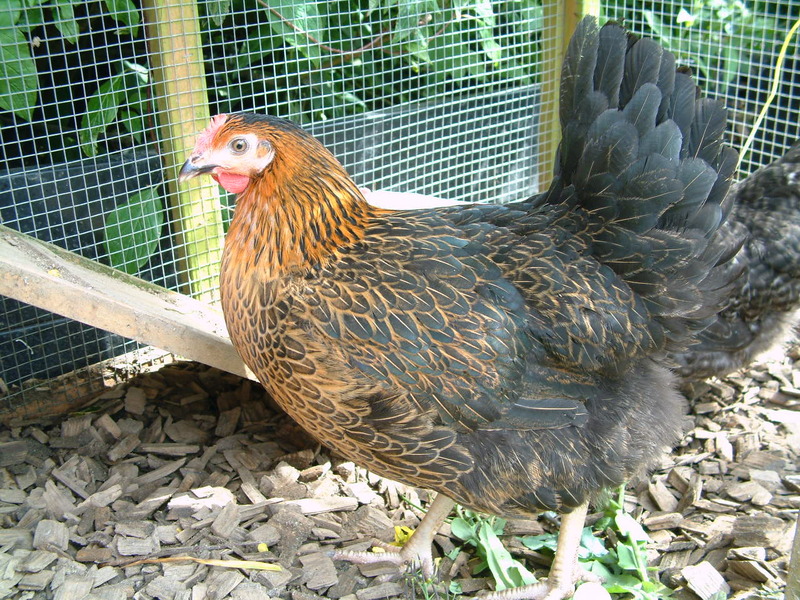 I would not keep chickens in the fruit cage permanently, unless I had a very big fruit cage and just a few chickens – in which case the loss of fruit might be at an acceptable level and there would be enough ground for them to scratch around without doing too much concentrated damage. 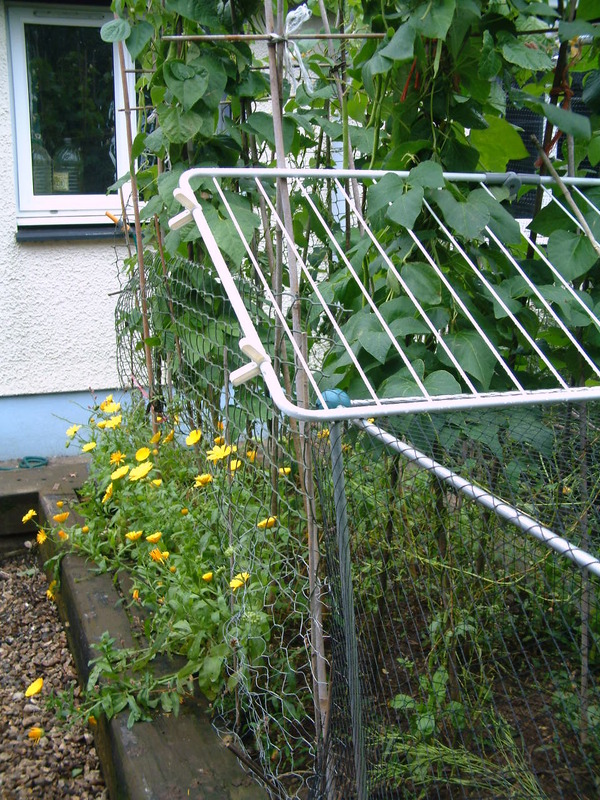 However, I think it unlikely that you’d have a sufficiently big fruit cage for this to work and all low-growing fruit would be likely to be eaten. I do, however, allow ours into the fruit cage occasionally in the winter – partly because they enjoy rooting around in an otherwise forbidden area and partly because they eat some of the slugs in there. I am careful to prevent them going during the spring when fruit is starting to develop because they have no qualms about eating unripe fruit – don’t think that because it’s still green, it’s safe from their attention! The other time I put a chicken in the fruit cage is when I have one that needs to get over being broody. Aliss is particularly susceptible to broodiness and will, if allowed to, sit on the laying box for days at a time. When this happens, we turf her out into the fruit cage, where the only shelter is provided by the plants and where there are many things to pique her curiosity. She spends her days in the fruit cage and her nights with the other hens and after about 72 hours she’s usually over it. As well as preserving ground flora, roots and fruit, I have another reason for excluding our hens from the fruit cage – it seems to be a preferred habitat for frogs, toads and lizards in our garden. We often find frogs in there and it certainly provides them with a refuge. If you do not keep chickens you may be unaware that they can be enthusiastic meat-eaters and frogs seem to be particularly attractive to them. I’m always slightly distressed when one of my pest controllers eats one of my other pest controllers, so keeping them separate seems the best option! So, overall, the answer is that chickens and fruit are not the ideal combination in an enclosed area, but you can use the two to mutual benefit. Regular readers will know that Aliss the hen has turned out to be some sort of reincarnation of a velociraptor… but with a taste for vegetables rather than people. This is something of a relief – I wouldn’t want to take my life into my hands to go out and collect eggs, and the cost of a rifle might outweigh the savings as a result of not having to buy in so much protein – but there is now something of a battle going on as regards the vegetables. The reason for growing vegetables is so that (mostly) Mr Snail-of-happiness and I can eat them. Aliss disagrees. She is not content with left overs – lettuces running to seed, weeds, peelings, slightly manky kale leaves – she wants the good stuff. And she wants it fresh off the plants. The answer, therefore, is to place the vegetables out of harm. I want free ranging chickens to keep the slugs under control, so the hens run free whilst the vegetables are confined. This approach worked well with our previous little flock, but Aliss is wily… like a coyote as well as a velociraptor. In the past the hens were allowed in amongst some of the vegetables once they reached a suitable height. 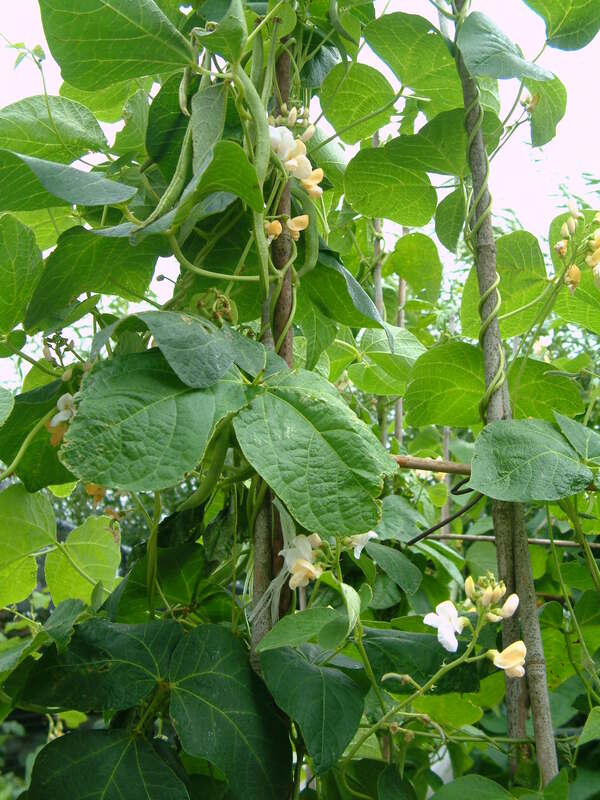 Runner beans were great – none of the old hens wanted to eat them and they provided shade if it was sunny. So, this year, once the beans were well on their way up the bean poles, we opened the area to the hens. All went well until… Aliss developed a serious taste for runner bean leaves. And not just one or two, and not just up to a height of a foot. Once she’d stripped the bottom leaves, she started jumping up to get at leaves above chicken head-height. 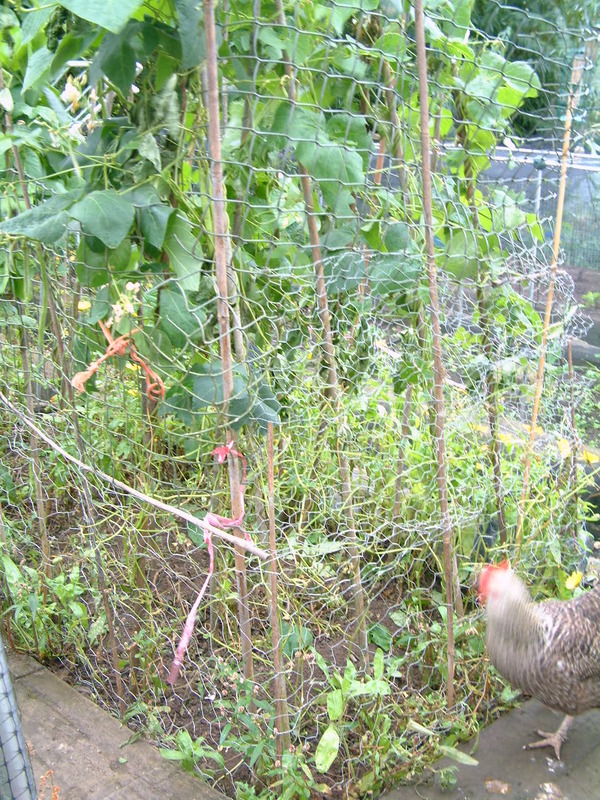 Enough was enough, so we reinstated the chicken wire… it’s about two feet high and is usually enough to put them off. Not Aliss, though. She simply jumped over it. And then beans started appearing, so she decided to try those… and found them to be delicious. 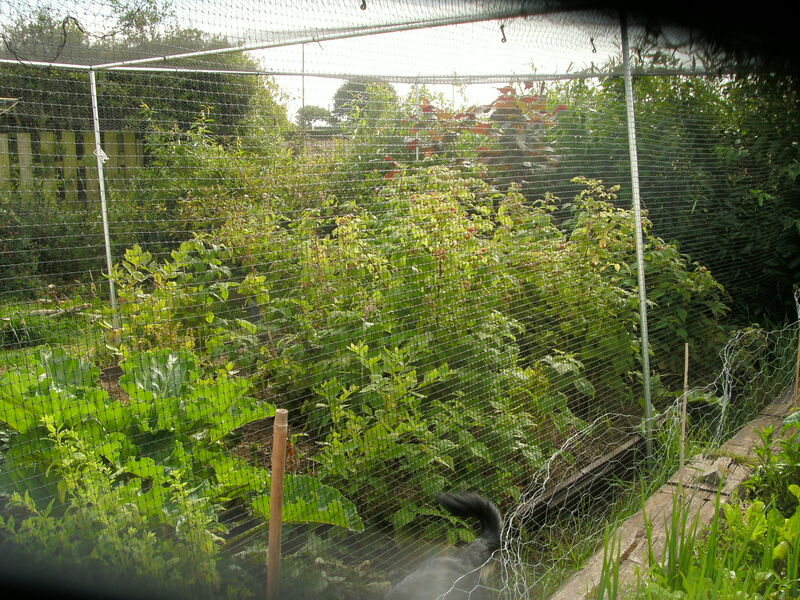 So, I erected an extra layer of chicken wire… four-foot high now. 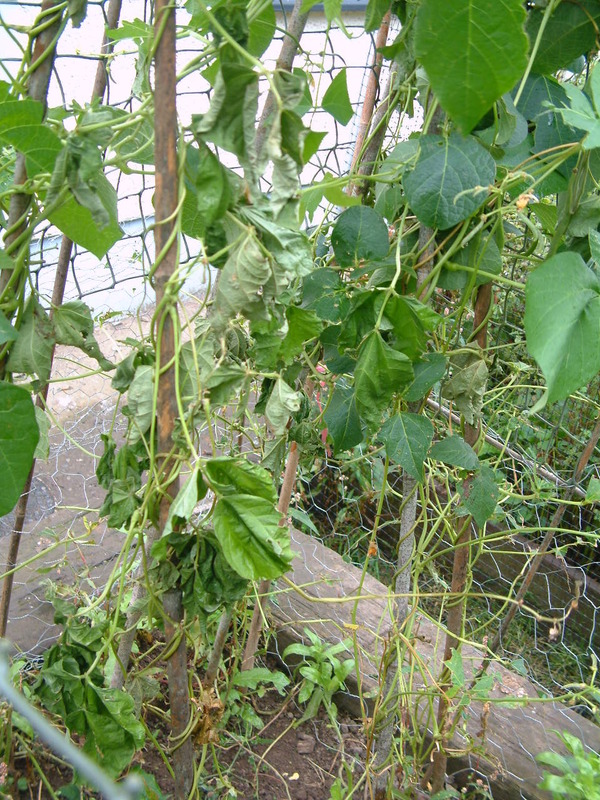 Aliss managed to breach the defences and also use the structure to reach beans that were otherwise out of her reach. By this stage, she’d also convinced Perdy, her partner in crime, to join in too! Throughout the film Jurassic Park there are allusions to the fact that dinosaurs are more like birds than reptiles. I think that we have one of their descendents in the garden. Yesterday Aliss was found excavating the root parsley, having somehow got in to the vegetable enclosure. She was removed, the netting examined for gaps, and any sources of weakness dealt with. Ten minutes later she was back in there. Additional barriers were added at the points we thought she might be entering. Five minutes later she was back in there, having flapped over the barriers. Netting was placed over the top of the target area. Ten minutes later, she was in there again. Busily excavating. The netting was rearranged – corners were tucked in, gaps were blocked, canes were used to secure edges of mesh. We watched what she would do. never attack the same place twice. They were testing the fence for weaknesses, systematically. They remember. And so did Aliss… working her way round the perimeter of the entire area – testing for weaknesses. It took her quite a while, but eventually she returned to her starting point, having been unable to gain access anywhere. And at this point she gave up and went away to investigate another part of the garden. We should be careful of when we give names. 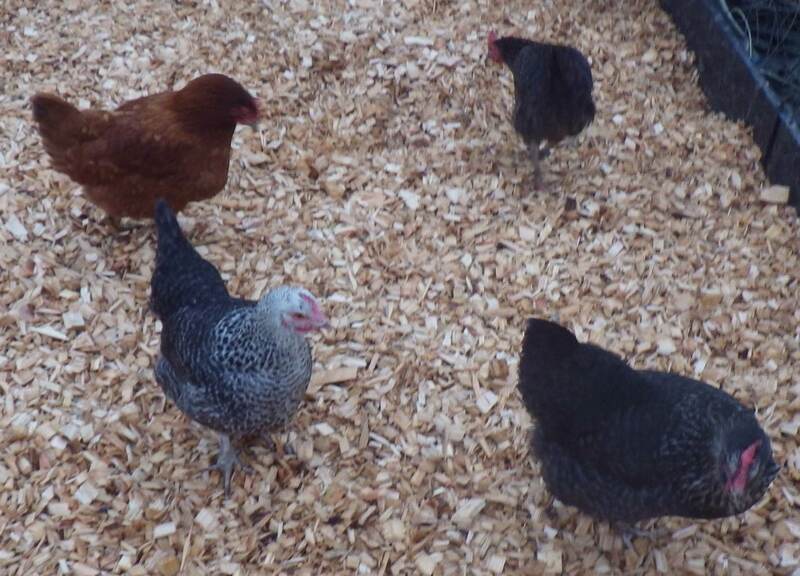 Black Aliss is living up to hers, just as Esmeralda has turned out to be top chicken. I wonder if Perdy will start singing opera next!